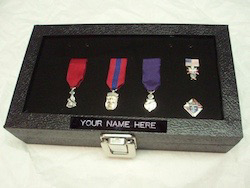 Small Glass Top Shadow Box Case with Velvet Pad made Exclusively for your Mini-Jewels and Lapel Pins. A Black Coated Wooden Box with Metal Hinges and Clasp. 8-1/8"W x 4-3/4"D x 2"H. Engraved Plate Available.